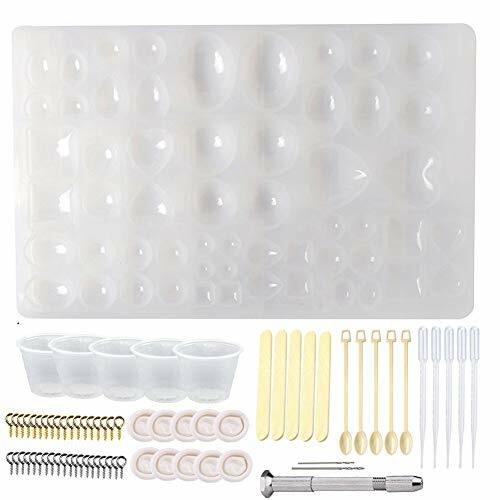 1, PERFECT RESIN CASTING MOLDS AND TOOL KIT:12 pieces of jewelry casting molds in different designs, 10 finger cots, 5 plastic spoons,5 plastic droppers,5 plastic measuring cups, abundant styles and complete accessories can bring lots of conveniences in the process of hand craft DIY jewelry making. 2, HIGH QUALITY SILICONE JEWELRY MOLDS: All jewelry molds are made of durable silicone material, very flexible and easy to clean, easy to demold, and with the transparent appearance, you can check the bottom when process project. 3, ESSENTIAL JEWELRY MAKING TOOLS:plastic droppers will help you extract liquid, plastic cups with graduated marking are smooth to help with complete mixing, package also contains the tools you need for the DIY process, making your jewelry DIY easier. 5.GREAT GIFT CHOICE FOR YOUR FRIENDS: This re-usable resin casting mould set is a great choice for you to share your handicraft with your friends and family, enjoy your happy times together, and it would make a wonderful gift for any of the crafty people in your life. If you have any questions about this product by Shxmlf, contact us by completing and submitting the form below. If you are looking for a specif part number, please include it with your message.